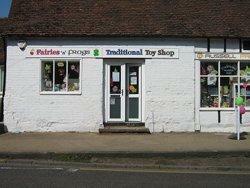 A traditional toy shop in the Georgian town of Ampthill. If you after something affordable, but a little different then hop along to Fairies n Frogs where a range of educational toys, childrens craft, jigsaws, a large range of wooden toys and pocket money toys, suitable from birth - 9 years old will greet you. Whether its buying something small for a friends party at school or an extra special gift for your own family member hopefully I will have something ..But If I dont, I can order it in for you, and even try to beat the best price online. I also offer additional services such as gift vouchers and birthday wish lists and gift wrapping service.